Toyohara Kunichika (1835-1900) The actor Bando Hikosaburo V as Nikki Danjo from an untitled series of actor bust portraits,1869. Deluxe Oban. Coming so shortly after the great 1860-1863 series by Kunisada, this series of 1869 remains one of the two or three truly outstanding series by Kunichika, Kunisada’s pupil. Like the Kunisada series, this early set uses the little used okubi-e (large head) format which was popular in the eighteenth century until it was prohibited on moral grounds in the early nineteenth century. Kunisada revived the form - almost certainly under the influence of the Osaka artists who had used it almost exclusively from the 1840’s. The form is difficult to pull off; the drawing has to be bold and certain and the use of line in the composition and description of features must be perfect or the piece becomes weak and ineffective. 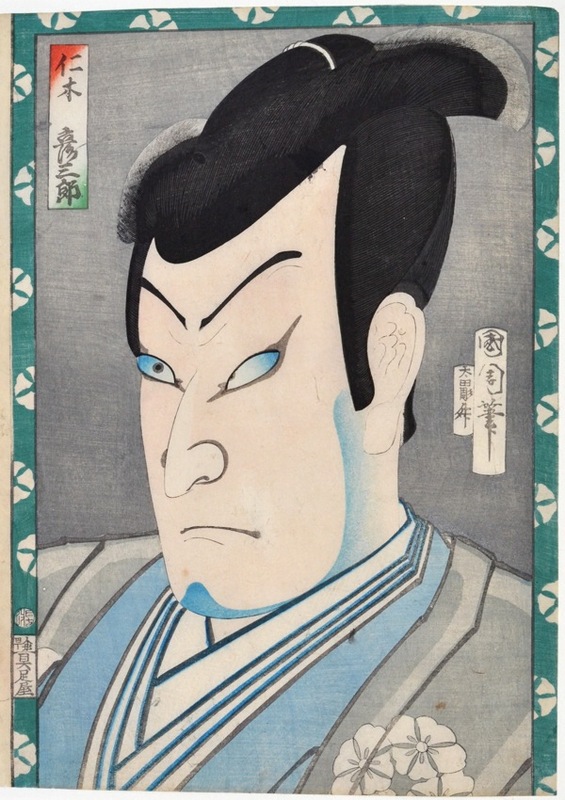 In this great print, Kunichika depicts the actor Bando Hikosaburo V as Nikki Danjo, the kabuki theatre’s own pantomime demon. Danjo is the anti-hero of the play Meiboku Sendai Hagi, which involves the tale of a palace intrigue and real events involving the Date clan of Sendai during the 1660’s, although because of censorship over historic subject matter in the theatre, names, dates and details were changed. The child Tsuruchiyo has become head of the clan. He is kept in the women’s quarters and looked after by a nurse maid (Masaoka) for fear of assassination. The palace chatelaine and her brother Nikki Danjo plot to kill the young prince. In a moving scene Masaoka’s young son is killed in error but such is her devotion that she shows no emotion and continues the fiction that it is in fact Tsuruchiyo who lies dead. As a result she is handed a scroll with the names of the conspirators. Her true loyalty is finally discovered and a fight ensues which sees a gigantic rat appear on stage and run off with the scroll in its teeth. The final scene is a classic of kabuki drama. A servant spots the rat and attacks it; it escapes but dramatically re-emerges through a trapdoor in the hanamichi (the stage extension into the theatre audience) in the true form of Nikki Danjo and carrying the scroll in his mouth. He exits the stage as if walking magically on clouds. This is a very popular subject in ukiyo-e. There are many prints of Nikki Danjo, dressed in grey, floating on a cloud emanating from a giant rat. In this print we can clearly see the influence of Kunichika’s teacher Kunisada in both the format and in the drawing of the features. Kunichika pictures Danjo three-quarters on, his head occupying most of the sheet. The colour scheme is in the unearthly blues and greys reserved for the supernatural, and the border of koraibishi (chestnut petals) refers to the actor crest of Hikosaburo. The colour and impression are very fine, condition is superb, the lower margin slightly trimmed. Scattered mica on the background, burnishing to hair, embossing to the collar. The print is illustrated on page 97 of Newland, Time Past and Time Present: Images of a Forgotten Master, Hotei Publishing 1999. Published by Guisokuya Kahei, signed Kunichika hitsu.